You've got your new WordPress website up and running for your blog or business and everything looks great. Things are running smoothly and you're beginning to see how having an effective online presence can roll right into profits. However, it isn't necessarily smooth sailing from here. There are a few vital responsibilities that can't be neglected if you want to actually maintain an efficient, secure and fully functioning site. One of those duties involves setting up a backup solution. If you have yet to implement a security and backup plan for your site, then it is suggested that you do that right away. As with most things involving technology, backup solutions have evolved over the years. Bloggers and business owners no longer have to rely solely on hard drive backups or tapes to protect their important files or their website. Hard drive backups can't always be counted on to be free of human error or to be quickly recovered when needed. This is why many have turned to the concept of offsite storage for their WordPress backup solution. 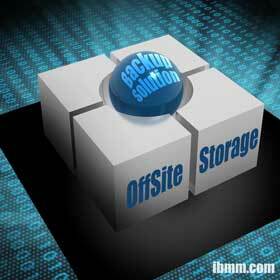 Offsite backup can get as simple or as complex as you need it to be. The basics of it involve protecting all of a blogger's or company's website data from hackers, malware, computer crashes, natural disasters or anything else that can wipe out your content. Copies of your files and database are sent to and stored in an offsite data center, keeping them safe from compromising situations that your onsite location may face (fire, flood, theft, file corruption, etc). You can select which files are the most important to back up and how often you need backups performed. The greatest benefit of any good WordPress backup solution is peace of mind knowing that all is not lost when disaster strikes. You will be able to restore your site quickly back to the original content with the backed up files and database. Using offsite storage includes the flexibility to perform a manual backup with the simple click of a button or schedule them to be automatic as often as you wish. and file sharing is easily available between co-workers. Prepare yourself and your business for disaster. A WordPress backup solution that includes offsite data storage gives you easy access to your content and a high level of comfort knowing your precious data is safe and sound. Tiffany Olson hails from Northern California and works as Communications Manager at Optimize Worldwide, a small web development firm based in Redding, CA. The team at Optimize use WordPress as their #1 platform to build websites.